Arthur Mitchell (born March 27, 1934) is an African-American dancer and choreographer who created a training school and the first African-American classical ballet company, Dance Theatre of Harlem. Among other awards, Mitchell has been recognized as a MacArthur Fellow, inducted into the National Museum of Dance's Mr. & Mrs. Cornelius Vanderbilt Whitney Hall of Fame, and has received the United States National Medal of Arts and a Fletcher Foundation fellowship. Mitchell is one of four siblings and grew up in the streets of Harlem, New York. He had to grow up fast; when Mitchell was aged 12, his father was incarcerated, leaving the financial responsibility on Mitchell. He had to work numerous jobs to help support his family; he shined shoes, mopped floors, delivered newspapers and worked at a meat shop to help his family make ends meet. Despite his strong work ethic and good head on his shoulders, Mitchell was involved in street gangs, but it did not stop him from finding a way out of his neighborhood. As a young teen in Harlem, Mitchell was encouraged by a guidance counselor who saw his talent to apply to the selective High School of Performing Arts. He was accepted and decided to work toward making a life in classical ballet. When he graduated from the High School of Performing Arts in New York City in the early 1950s, he won a dance award and a scholarship to study at the School of American Ballet, the school affiliated with the New York City Ballet. In addition, in 1954 Mitchell performed in the musical House of Flowers, alongside Geoffrey Holder, Alvin Ailey and Pearl Bailey. 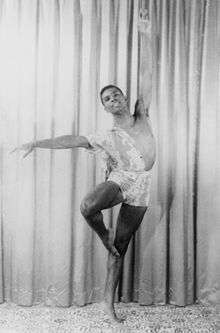 In 1955 Mitchell made his debut as the second African American with the New York City Ballet (NYCB), performing in Western Symphony. Rising to the position of principal dancer with the company in 1956, he performed in all the major ballets in its repertoire, including A Midsummer Night's Dream, The Nutcracker, Bugaku, Agon, and Arcade. Mitchell was the second African-American dancer with the NY City Ballet until 1970. Choreographer and director of the NYCB George Balanchine created the pas de deux in Agon especially for Mitchell and the white ballerina Diana Adams. Although Mitchell danced this role with white partners throughout the world, he could not perform it on commercial television in the United States before 1965, because states in the South refused to carry it. After the assassination of Dr. Martin Luther King, Jr. in 1968, Mitchell returned to Harlem, where he was determined to provide opportunities in dance for the children in that community. A year later, he and his teacher Karel Shook formed a classical ballet school. Mitchell had $25,000 of his own money to start the school. About a year later he received $315,000 in a matching funds grant from the Ford Foundation. Dance Theatre of Harlem (DTH) was born in 1969 with 30 kids in a church basement in a community where resources of talent and creative energy were virtually untapped. Two months later, Mitchell had attracted 400 youngsters attending classes. Two years later they presented their first productions as a professional company. Mitchell used his personal savings to convert a garage into the company's first real home. In Harlem, DTH created an explosion of professional opportunity in dance, music, and other related theater activities. The school has an outstanding number of former students who have been successfully engaged in careers as dancers and musicians, as technicians in production, stagecraft, and wardrobe, and in instruction and arts administration. With this success, DTH challenged the classical dance world to review its stereotypes and revise its boundaries. Mitchell's archives are to be held at Columbia University. 1993 – Kennedy Center Honors, one of the youngest persons recognized. 1994 – Named as a MacArthur Fellow. 1999 – Inducted into the National Museum of Dance C.V. Whitney Hall of Fame, Saratoga Springs, NY. 2001 – The 7th Annual Heinz Award in the Arts and Humanities. 2005 – Awarded a Fletcher Foundation fellowship in its inaugural year, in recognition of his contributions to African-American culture. 2006 – Mitchell and the Dance Theatre of Harlem were honored at the White House by President Bush with a dinner in his honor. In addition, Mitchell has received honorary doctorates from numerous leading universities, including Hamilton College, Brown University, City College of the City University of New York, Harvard University, The Juilliard School, The New School for Social Research, North Carolina School of the Arts and Williams College. He has also received awards from the City of New York and community organizations. 1 2 3 "Arthur Mitchell". National Visionary Leadership Project. 1 2 3 4 5 Arthur Mitchell, the-ballet.com; accessed March 27, 2016. ↑ Kourlas, Gia (May 15, 2015). "Columbia Acquires Archives of Arthur Mitchell, Dance Pioneer". New York Times. New York City, US. Retrieved May 19, 2015. ↑ Arthur Mitchell profile, theblackmarket.com; accessed May 23, 2008. Miles, J. H., Davis, J. J., Ferguson-Roberts, S. E., and Giles, R. G. (2001). Almanac of African American Heritage. Paramus, NJ: Prentice Hall Press. Potter, J. (2002). African American Firsts. New York, NY: Kensington Publishing Corp.
Wikimedia Commons has media related to Arthur Mitchell (dancer).